Few children have seen the world's second fastest land animal (next only to the Cheetah). In truth, most people have never experienced the pure joy and beauty of a Greyhound in full stride, muscles straining, completely focused on the instinct of a thousand years to run. When not coursing, a Greyhound is an animal of uncommon sweetness and gentility. Looking into the eyes of these noble creatures helps to instill a sense of reverence for our common environment, and a respect which we owe to all creatures with whom we share this fragile planet. 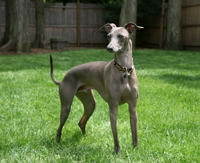 Greyhounds make excellent pets; they are sensitive, intelligent creatures who adapt easily to their new life. If you are looking for a new pet, won't you please consider a greyhound? Adopting a greyhound requires a lifelong obligation to love and care for your new family member. Think realistically about your life style to determine if you have the time needed to ensure a happy pet. Basically a Greyhound is like all other dogs, but because of its training and racing career has some unique characteristics. Greyhounds, like all other dogs, are pack animals which means that they are social creatures who live in a social hierarchy. Most dog behavior problems arise out of an owner's misunderstanding of the proper role of the pack leader. 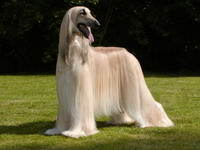 Among the numerous breeds of dogs, Afghan hound is one of the oldest breed. They are the type of dogs who assist the hunters by tracking or chasing the animal being hunted.